I was once delivering a training of trainers course. One of the participants was already an experienced trainer who was herself delivering training of trainers courses yet decided to attend my training to see how I delivered that course. During one of the sessions of the course, I asked participants to provide a brief 10-minute demo of workshops they are preparing. That participant, who is already a trainer, raised her hand to have a go at providing a demo of her workshop. I allowed her other colleagues to take turns first then signaled to her to come present her demo. She came and stood in front of her colleagues with great confidence, briefly introducing herself by mentioning her name then mentioning the title of her workshop. She then proceeded directly to telling a story related to the subject of her workshop. It was an actual story that had taken place long ago and contained powerful lessons within it. The assigned 10-minutes for the demo came to an end and I signaled to her to stop. She had not completed the story and wanted to continue. I told her that time was already over. Many participants pleaded and begged me to let her continue with the story she had started. They were so eager to listen to the rest of the story to know what happened next. Nevertheless, I refused her extra time so that she would learn how to manage her time better next time despite the many pleadings I got from her colleagues who had been following her story with full attention and deep engagement. After she went back to her seat, I praised the technique she used during her demo which was storytelling. I pointed out to participants of the training of trainers course the fact that they were fully engaged with the story she was narrating and how they were dying to have her continue it. This experience showed everyone how engaging storytelling can be. Storytelling is a very powerful technique that can be used by the trainer during a training session not only to deeply engage participants but also to achieve a deep lasting effect and induce a strong learning experience. The human mind is designed to handle stories exceptionally well in terms of attention, retention, digestion, reflection, deduction and later practical use of the information in and deductions from such stories. The most effective kind of story is one the trainer has experienced himself and was part of. The second best are real stories the trainer had heard or read about. A third type of story, still very effective, is fictional stories that make a point or provide specific lessons. No matter what the training is about, a competent trainer can make good use of the storytelling technique to achieve deep engagement of participants and a strong and lasting learning experience. A trainer may even allow and encourage participants to use storytelling themselves during their presentations or as part of other training activities during a training session. Is there a story that has changed your life after you listened to it or read about it? Tell use about it. Story telling is an important skill that any professional trainer should master and be able to use effectively during training. The human mind is designed to accept, enjoy, seek, retain and make use of stories effectively. Stories are the natural way through which rich information is passed to the human mind. Stories may contain emotions which reinforce the learning process, boost retention and improve comprehension. Stories include time sequence which also help create a natural sequence between events. Stories are very rich in connections and relationships among various elements of the story which makes them a very powerful and effective learning tool. Stories are anti-boredom tools that can be used in the training room. One additional interesting thing about stories is that they can be a very rich source for reflection. Trainees can draw lessons from a story on their own and make discoveries. They can even keep discovering new lessons from a story long after they have listened to it. Another reason that makes stories very powerful is their ability to convince trainees and influence them through touching their emotions and providing a logical sequence of events. 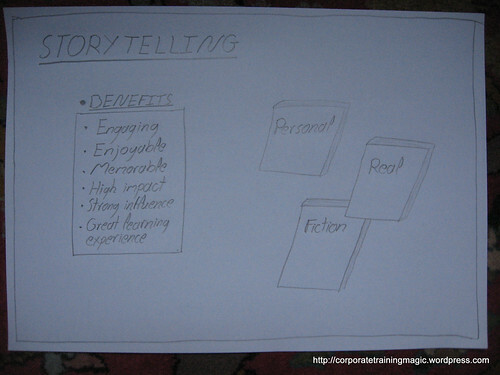 Stories also evoke trainee imagination which creates a high degree of trainee engagement, enjoyment and retention. One type of story is the fictional story or the fable. Although such story is not real yet it still enjoys the elements of engagement, enjoyment, time sequence, reflection and retention. An even more powerful story is a real story that has actually taken place in real life in the past and that the trainer might have heard or read about. If the trainer has learned about such a story firsthand by listening to it directly from someone who has experienced it this provides for an even stronger type of story. The trainer in such case should mention that he has heard it from a person who has experienced it himself. The most powerful type of story at all is one that the trainer has experienced by his own self and has learned from. This is the most powerful type of story and the most engaging and convincing. One sub-type of such a story is when a trainer talks about his past mistakes which makes the personals story even more powerful and influential. Personal stories also help create an even stronger bond between the trainer and his trainees. If there is no personal story covering the concept being explained the trainer can resort to stories he has heard or read about or to fictitious stories. Storytelling is a very powerful tool that every professional trainer should master and be able to use effectively during training. What else makes stories so enjoyable and important?